Redefine “ghost” as an act of “thinking to the dead”. Not a noun. Based on that definition, the actor rides a taxi against the “dead” he　wishes to see, and imagines, interviews with the dead, and interacts　with the dead. An attempt to perform the text written through the　process while making full use of the body and video. Question　abstraction of “boundary” or “territory” with original methodology　which fused method of “dance” “rakugo” “documentary”. My best friend committed suicide in the winter of 2010. It seemed to be crushed by many emotions such as the guilt feeling that he was not nearly able to save it, the sense of alienation that he survived, and the anger of not allowing suicide. I thought that I wanted to see him, he could be a ghost, and I visited a river-side park where he committed suicide at midnight. However, no matter how much I waited, no ghost appeared. 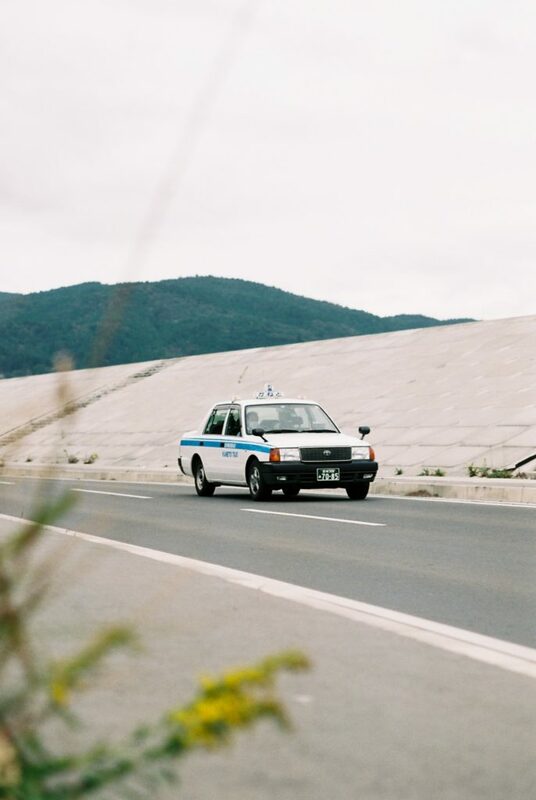 The following year, the East Japan Great Earthquake occurred, and after a while I heard the story that taxi drivers looking at ghosts will continue in the streets along the coast of Tohoku-area, which was greatly damaged by the tsunami, visited the local coverage. Although I was able to touch the episodes of the drivers who saw the ghosts, those episodes had the existence of “ghosts” that they met, the desire to meet and feelings I felt and various emotions were projected I firmly embraced the thought that it was a product of imagination. Perhaps we survived, It is important to us that we have a sense of guilt (Survivors Gilt) that we survived, not to say whether there are ghosts or not, but rather to continue dialogue with those who have become dead It was thought that it was a posture of a person. So I thought that I should define the existence of “ghost” again. Do not put the ghost in the framework of entertainment / consumption named “spirit” or “horror”. Ghosts can act more actively on our lives. To face ghosts is a posture that “do not forget” the past tragedies and disasters, because continuing that dialog will lead to not making the same mistake. For example, we define a ghost to be invisible. Those not to be visualized. No, it should be able to be visualized, but it is a figure that is hiding. By redefining such ghosts, the existence of people who live with their breath is emerging. Living / dead, ghost / non-ghost thing, center / periphery … I hope that every boundary will dissolve, decided to launch the work around the form of theater. We will produce this work in Germany. A country that made a choice to leave a negative heritage to keep Nazi Germany memorable. Also, it is a country that has shown positive attitude toward actively accept refugees and actually accepted it. What comes to my mind living in Japan is the debate over dark tourism as to whether we should leave the site of nuclear power plant accident or not to leave, the war remains during World War II that have already been destroyed, In contrast to Germany, the circumstances surrounding refugees whose forced repatriation continues. In Germany’s long-term creation, in Japan, places and people who are “invisible” may be “visible” in Germany. Dialogue with them hopes to raise the resolution of our sensitivity to everyday life and hope that the urgency will be reflected in the work. Please make reservation from the TPAM. Born 1985. Majored Philosophy at Waseda University(JAPAN). He is Winner of the Excellence and Audience Award in the 2010 Image Forum Festival for his documentary “Graduation”. “The End of the Special Time We were Allowed”, a film taking on the suicide of a friend, which took 7 years to complete, was chosen for the New Asian Currents Category in the 2013 Yamagata International Documentary Film Festival. The same film has been distributed in 12 countries, and shown in multiple international festivals after its national release. The film shot in Kamagasaki, Osaka , “Fragile”, premiered at the Tokyo International Film Festival, and has since been decided on a national release. Has participated in Chelfitsch works as an actor since 2010. Hydroblast was established in 2017 by Shingo Ota(writer, director) Hydroblast is to clean cast metal by blasting high water pressure with or without sand combined from a nozzle. The object being cleaned called “work”, is blasted by water, and the water removes any dirt or paint. Hydroblast is used mainly for removing the white lines on the streets, graffiti, or dirt, but these days it has been introduced to the nuclear power plants to clean out infected metal. They have been named after this cleaning process in the hopes that they will obliterate, remove, and clean various stereotypes, segregation, and prejudice instilled in society and to symbolize social diversity by using drama.